Peel Region and the Brampton and Mississauga Traffic Courts. 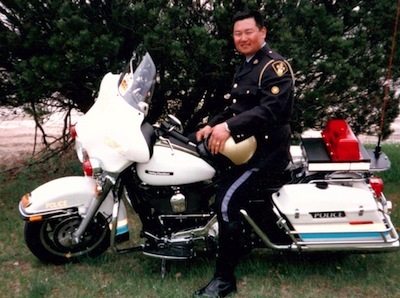 Eddie Cho is a retired Police Officer who worked with the Ontario Provincial Police on Ontario’s 400 series highways as a Breathalyzer Technician, Accident Investigator, and Radar/Laser operator. Eddie has 20 years of experience in the Brampton and Peel Region Courts fighting traffic tickets. As a well known advocate for his clients rights, Eddie is the paralegal to fight your traffic ticket in Peel Region. Eddie also appears in the Mississauga Traffic Ticket Court on Burnhamthorpe Road in Mississauga. Dear OTT Legal Brampton Office I knew right from the beginning I stepped into the OTT Brampton office that I made the best decision to fight my speeding ticket. The speeding ticket case successfully ended with the ticket being completely withdrawn. Mr. Eddie Cho was extremely confident yet kind, had expert insight and my meeting gave me valuable interaction. The office staff gave me the high standards of professional service from my first meeting and to the end of the trial. Dear Eddie Cho Just want to let you know that I got your letter advising that my two traffic ticket charges were dismissed and that my driver record is clear of these tickets and demerit points. You won’t realize how relieved and thankful I am hearing this, you made my day and maybe my year! Thanks so much again for the very professional and caring way you handled my request…much appreciated, Stella J.Brampton. OTT Legal Brampton Thank you for representing me for my traffic ticket matter at the Brampton Provincial Court. As you can appreciate, these traffic tickets caused me a great deal of anxiety, so it was quite a relief to receive your letter advising me that the charge had been successfully withdrawn. Thanks very much David M Brampton. Eddie has 25 years of experience in the Brampton and Peel Region Courts fighting traffic tickets.